For fans of Lauren Kate's Fallen series comes the exciting conclusion to the trilogy that includes The Beautiful and the Cursed and The Lovely and the Lost. The Waverly sisters must save themselves before all is lost. Since the Waverlys arrived in Paris, the streets have grown more fearsome by the day. As Ingrid learns to master her lectrux gift, she must watch Axia's power grow strong enough to extend beyond her Underneath hive. By all indications, the fallen angel's Harvest is near-and the timing couldn't be worse. Targeted by vengeful gargoyles, Gabby has been exiled to London for her own protection. Meanwhile, the gargoyle castes are in disarray, divided between those who want Luc to lead them and those who resent him and his fondness for humans. The Alliance is crumbling from the inside as well, its members turning against one another, and possibly against the Waverlys, too. Axia has promised that the world will burn. And now, unable to trust the Alliance, separated from Luc, Gabby, and her twin, Grayson, Ingrid is left to face the demon uprising alone. I loved The Beautiful and the Cursed. I loved The Lovely and the Lost. BOOK THREE NOW PLEASE. I LOVE this series. I'm definitely excited for this book. Wonderful series, beautiful books and a lovely author. Lots of win. Great pick! Sorry Alyssa, I haven't started this series yet. Its one that keeps slipping down the list. Maybe I'll get a chance to catch up with it in 2015. Thanks for sharing and hope you're having a great week. Awww! I highly recommend it, Marilyn. THANK YOU!! Thank you so much, Alreem! I so know how you feel D: Thank you, Jessica! Right?! Gorgeous! I loved the first two books so much. Thank you! New to me but sounds good, and hope you get a chance to read it soon. YEEEEEEEEEEEEEEES!!!! I NEED BOOK THREE LIKE YESTERDAY!!! AND I THINK THIS COVER IS MY FAVE OF THE THREE OF THEM!!! Right?! I'm excited too, no worries! Hope it's an amazing conclusion novel. I haven't read any in this series. 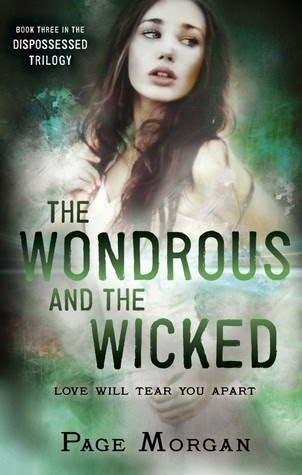 :( I love the cover though and really want to read this series. Thanks for sharing. Also, I have a $30 Amazon giftcard giveaway going on, so don't miss it. NOW YOU HAVE :D The covers of all three books in the series are gorgeous! I haven't read any of the books in this series. I hope you enjoy reading this one. Haven't read this series yet! I didn't even realize the second book already came out, ha. Hope you enjoy it tons when you get your hands on it! Yeah! It came out earlier this year. Thank you so much, Cyn! Right?! But it's totally worth reading the entire series! You definitely should read them! And a love triangle has not been introduced yet, so I can't imagine the author doing so in the third and final book O_O Thank you! I think you shouldddd, Rachel!! Thank you!